“We’re going to use this majority to defend women, to uplift families, and to end the Trump administration’s unconstitutional attacks on reproductive health care,” said Rep. Barbara Lee (D-CA), the Pro-Choice Caucus' other co-chair. The Congressional Pro-Choice Caucus convened with reproductive rights advocates on Capitol Hill on Tuesday to outline its priorities for the new session of the U.S. Congress, promising to fight back against anti-choice restrictions such as the global gag rule and the Hyde Amendment. The kind of oversight that Chu promised became more likely with Tuesday’s announcement that Pro-Choice Caucus Co-Chair Diana DeGette (D-CO) was named chair of the House Energy and Commerce Committee’s Oversight and Investigations panel. The committee has “direct oversight authority and the power to investigate the actions of several prominent federal agencies,” including the U.S. Department of Health and Human Services, according to a press release from DeGette’s office. “The Trump administration’s final rule is expected any day now,” she continued, explaining that the proposed rule could shut down many Planned Parenthood facilities. 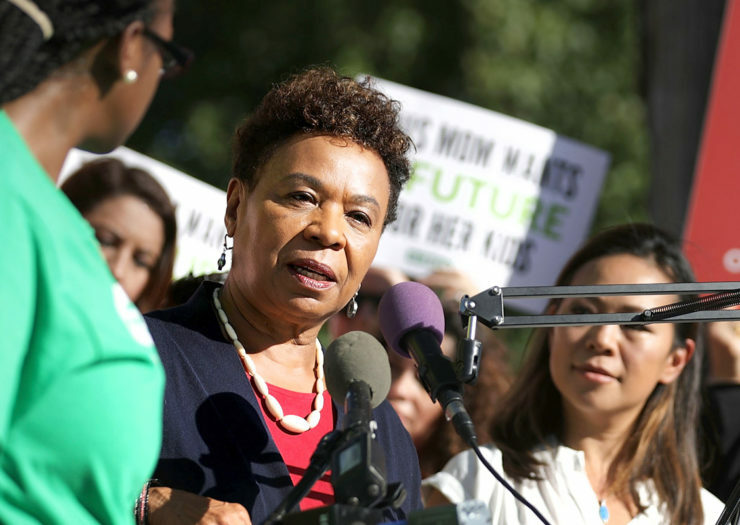 “We’re going to use this majority to defend women, to uplift families, and to end the Trump administration’s unconstitutional attacks on reproductive health care,” said Rep. Barbara Lee (D-CA), the caucus’ other co-chair. Lee said she would re-introduce the EACH Woman Act, “the boldest pro-choice legislation in history,” which would end the Hyde Amendment’s ban on federal funding for abortion. The anti-choice restriction disproportionately affects access to abortion care for people with low incomes and people of color. “We believe in science. We believe in evidence .… We’re going to be bold,” Lee said. Analysis published by ThinkProgress in late November found unprecedented support for ending Hyde in the House. “By ThinkProgress’ count, at least 183 House members support repealing the Hyde Amendment,” reported Amanda Michelle Gomez. When it comes to Lee’s measure to permanently end the restriction, the publication found that “the bill needs support from at least 35 more representatives to pass.” The legislation would be unlikely to pass the Republican-controlled U.S. Senate or to be signed by President Trump. Data for Progress last June found that the unprecedented number of women running for office “dramatically increases the prospects of overturning the Hyde Amendment.” Already, several of the House’s most buzzed about new members, including Rep. Ilhan Omar (D-MN), who spoke later at the Pro-Choice Caucus event, have unapologetically rejected Hyde. Rep. Nita Lowey (D-NY) said she would re-introduce the Global Health, Empowerment, and Rights (HER) Act, which would roll back the Trump administration’s global gag rule. “For decades, some of us have been fighting against the global gag rule, which has been shown to not only increase abortions but also to decrease the effectiveness of our foreign aid by preventing the United States from working with our most experienced and trusted partners abroad,” she said. “Its hard to believe that we have arrived at a terrible place where the administration is trying to replicate this abhorrent policy at home,” Lowey continued, referring to the proposed domestic gag rule.